Wouldn't your think that since we spend our entire lives doing everything we do -- from thinking, tasting and hearing, to smelling, feeling and interacting -- that we'd be more aware of what allows us to do all these things? And since 90% of our communication is non-verbal, wouldn't it make sense to be more conscious of, yes, our bodies? Our bodies provide us the capacity to sense what is tasty, silky, sonorous, nurturing, dangerous and inspiring. Yet those of us who have been raised in the western world have come to worship, to hyper-focus on our intellects as the way to live effective and full lives. In contrast, our bodies and emotions (the topic of next month's newsletter) are given minor roles or omitted completely from life's lexicon because focusing on them is considered 'soft', inferior or even weird. Yet we suffer personally and professionally by abbreviating the full extent of who we are. By plowing ahead despite an unhealthily raised or lowered heartbeat, painful joints, head or stomach aches, we risk messages that something(s) is/are not right in our lives, not only physically, but perhaps also mentally or emotionally. By speeding to work without noticing the emergent signs of Spring, we eclipse the amazing wonders and gifts that life is presenting to us - for free. By ignoring a client's non-verbal cues, we miss the opportunity to make adjustments to our offer in order to a seal a deal. By being oblivious to a friend or colleague's slumped posture and barely audible "I'm fine" in response to the often perfunctory "How are you," we risk not only inhibiting a relationship, but diminishing our credibility as a sincere person. While analyzing and intellectualizing certainly have their rightful place, when we live primarily in and from our heads, we minimize not only our own lives, but quite possibly the lives of others and our connections with them. How can we engage all of who we are so that we can live effective, full lives? I'd like to propose a practice for you to commit to over the next four weeks. It is not only simple, but it will give you an opportunity to decide if paying attention to your body does in fact enrich your life, personally, professionally, relationally and with the world as a whole. If it does, which I believe it will, there are innumerable ways to become more body conscious and to make appropriate adjustments that you deem necessary to maximize your engagement in and with life. 1. SETTING THE STAGE: Once each day for five minutes, assume you cannot speak. The only messages you can receive about yourself, others and the world around you are non-verbal. 2. SELF: Begin by focusing inside yourself. How fast/slow, shallow/deep is your breath? Now scan your muscles and joints, from the top of your head to your toes. Are they tense, achy, relaxed? What might these indicators be trying to tell you about your state being? What happens emotionally or mentally if you make a physical adjustment? 3. OTHERS: Observe others' body movements and facial gestures. Take in the energy they emit. Are they attracting or repelling to you? What are their bodies telling you about them and about you? 4. WORLD: What sounds do you hear? How about colors, textures, shapes of things around you, both natural and man-made? Scents? REFLECT: Take it all in. What happens to and for you when you do? Can citizens make a difference in the way its country's government works (or doesn't work, as was the case in Liberia)? How about a group of determined, women who represent the height of courage, determination and commitment to what is right? If you want to be encouraged to make a difference in your life and the life of others you care about, Pray the Devil Back to Hell is a movie you must see. Women Advancing Microfinance Northern California (WAM NorCal), of which I am a member, is hosting this event including the movie, refreshments and guest speaker, Christiana Bendu Hunter. Christiana is from Lofa County, Liberia, in West Africa and is the President of the Association of Citizens and Friends of Liberia (ACFLihttp://acfli.webs.com/) based in Sacramento, California. She will discuss how Liberian women mobilized for peace and an end to the civil war. Tickets include film screening, discussion following the film and refreshments. 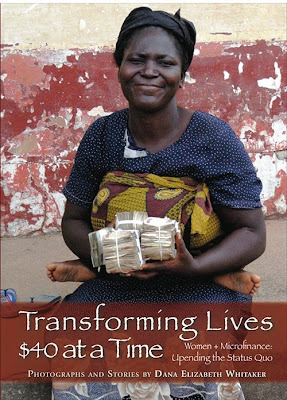 Book Talk with Dana: Mon, Feb. 22nd, 12-1:30, Berkeley - Microfinance: What, Where, Why, for & by Whom? What is microfinance? How does it work? Who is it for? How can I get involved? Learn the answers to these questions through Dana’s captivating stories and vivid photographs featuring heart-to-heart encounters with microentrepreneurs from 13 countries on five continents who are using microfinance to transform their own and their families lives, inside and out. *Each purchase will benefit an organization whose clients are included in the book.